Eeee..these looks like the "gold" that Mamarazzi dug out from my ears. 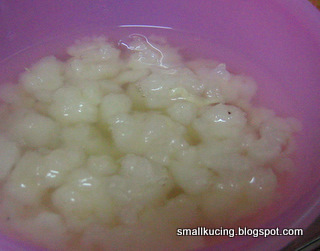 Mamarazzi said these are "frog Saliva"(Sheat Kap) but it's actually are frog fallopian tubes. Mamarazzi wanna cook dessert with it. No wonder people say Chinese will eat any thing and every thing. First, soak the "frog saliva" overnight. Then it will turn "fluffy" like this. Then peel some Gingko nuts. remember to cut the Gingko nuts into half and throw away the "pucuk" growing in the middle or else the thing will taste bitter. Some dried longan, rock sugar and Pandan leaves. Throw everything into the pot. Double boil it for 3-4 hours and then it's ready to be eaten. How do I like the "frog saliva"? I love it! Especially when Mamarazzi put it into the fridge to cool it. Taste like jelly. 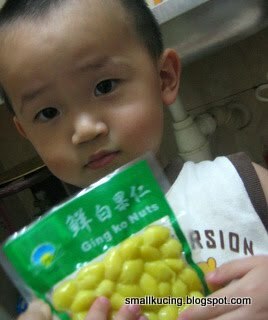 But I don't like the Gingko Nuts. 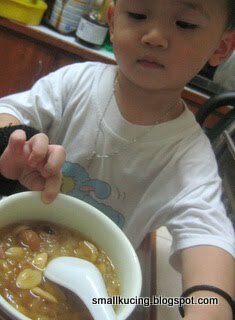 Just too bad coz Mamarazzi likes the Gingko Nuts coz she said it add flavour to the dessert. This dessert is said to be very goo for the skin. Those who can't afford to have Bird Nest, this is the substitute lor. kathy, i used to boil that when my kids were young like joshua.. they love to drink that, buti never told them that those are frogs' galls.. i think not saliva la.. the tam.. inside the dried frog.. tam is.. gall? 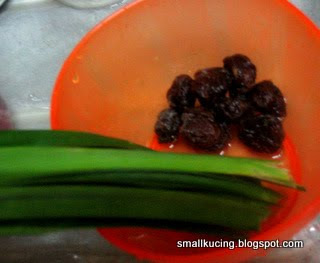 or something.. saliva is from birds nest.. or something..hahaha.. correct me if i m wrong..
Chop again! Eyew...no, thank you! You can eat all the frog saliva and whatever all by yourself. Hahahahaha! Wah lucky you, get to easy suit kap! :) I didn't know suit kap was frog's saliva! Funny! I thought 'shee kap' is known as lizard's skin? During pregnancy drank a lot. Now, only drink plain water. oh i love xuet kup!! my favourite with ginger and served cold! 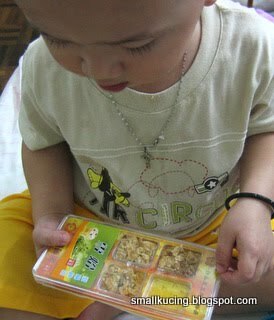 Wow...very good "bow beng"...I want! I tau makan only. Coz hear the "aunties" said is frog saliva so i also thought it's frog saliva lor. Coz we eat bird saliva...not surprise if eat frog saliva also.Then googled baru know it's not. Ya i drink this and birdnest when pregnant too. I thought apa frog saliva initially.. haha! i used to take it last time. maybe i should take it again. I think it is called Snow Jelly too. Cos yesterday I bought 2 cans of Snow Jelly with Ginseng extract for my daughter who has been coughing for a week. People said such jelly works, to improve children's lung and vitality. I couldnt get the uncooked snow jelly, so let her tried the can one last night. It has jelly in it too, but she only drank the syrup. Sometimes just close eyes and eat kau tim. the more know the more geli kakaka. I am sure but this Shuet Kap can get from Chinese medicine Hall. Depending on the quality. Long time I didn't eat this already oh. Can put pandan leaf, I also dont know. Oh, i love this!!! Can i have one please!! Yummy!! I heard cannot drink too much, very fattening? But you so skinny, never can drink as much as you can. So long i never drink already, now you remind me want to get some and boil this week! 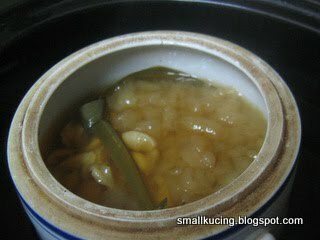 hahahhahahah..i prefer this than bird nest. So u drink or not? frog's saliva is good for expecting mothers? i only heard about pureness bird's nest is good for that. i thought shuit kap is a type of undersea seaweed? frog fallopian tubes? eww! how did they get so much? farm frogs for those parts?